Mystery 'Santa' donors all across the country have paid a total of approximately $500,000 towards toys, televisions, clothes, just in time for the holidays. 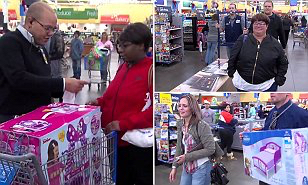 Tuesday, an anonymous donor, wanting to do something 'special' on his birthday, paid off more than $106,000 in layaways for other shoppers, at two Walmart stores in Cleveland, Ohio. This, just after an anonymous donor paid a tab totaling 180,000 at two Pennsylvania stores on Monday, and another donor paid off $200,000 at two Florida stores. A single anonymous donor paid off nearly $70,000 for the layaway items at the Steelyard Commons store in Cleveland and nearly $36,000 in nearby Lorain. She said, with four kids at home the holidays can be tough. 'This isn't the first time local do-gooders have paid off layaway tabs. In 2013, someone paid off $8,800 at the Avon Walmart. 'And in southern Ohio, last year, someone paid off $15,000 at a Moraine store and in 2012, the Cincinnati Enquirer reported that a former shoplifter paid off $1,000 in goods at a Lockland store. Wal-Mart manager Steve Myers told the website the store has previously received gifts between $2,000 and $3,000. 'He said he wanted to help take care of folks – to bring everyone a special Christmas,' Myers said. The manager told PennLive.com that 100 layaway balances came to approximately $50,000. He stated that 'Santa B' instructed money left over from his check should be donated. Myers stayed that 'Santa B''s was from nearby and wanted to remain anonymous. Employees said this was the second year in a row someone had paid off the layaways. Last Wednesday, a female 'layaway angel' gave $20,000 to a Bellingham, Massachusetts, Toys R Us. SOMEONE SHOULD DO THAT FOR PEOPLE WHO NEED DENTAL WORK. Fabulous story. It is so nice to see with all the hate lately, a story about something good. When I see a person in need in line behind or in front of me with very basic food items looking and re-looking at their items and cash, trying to decide what to put back . I just leave a $20, or purchase a Gift Card from the cashier for them and leave. Sure Christmas is time for giving, but good people occasionally get slapped year round with problems. Great to hear a heart warming story such as this! Thanks for sharing Lexy!